Nigeria: Bring Senator to Justice for Child Abuse! Nigerian Senator Ahmed Sani Yerima, 49-year-old former governor of the northwestern state of Zamfara, has outraged human rights, women's rights and children's rights advocates, by marrying a 13-year-old Egyptian girl, in a mosque in the nation's capital. He allegedly married the 13-year-old after paying a dowry of $100,000. Following an unprecedented public outcry from hundreds of activists and petitions to the Nigerian Senate to investigate the report, Ahmed Sani Yerima justified his unlawful conduct by saying he is only following in the footstep of the Prophet Mohammed. The good news is, Nigeria' Senate has made a move in the right direction - it has ordered an investigation into the allegations, in a bid to bring Senator Ahmed Sani Yerima to justice. Nigeria is party to international human rights conventions that guarantee the rights of children, such as the Convention on the Rights of the Child and the African Charter on the Rights and Welfare of the Child (ACRWC). "States Parties shall take all appropriate legislative, administrative, social and educational measures to protect the child from all forms of physical or mental violence, injury or abuse, neglect or negligent treatment, maltreatment or exploitation, including sexual abuse, while in the care of parent(s), legal guardian(s) or any other person who has the care of the child." Nigeria clearly has an obligation under international law to protect children within its jurisdiction from all possible violations of the rights of a child. The state is obliged to protect and guarantee the rights of the Senator's "child bride" and to bring the lawmaker to justice for abusing and violating the rights of a child. Child and forced marriage is a shameful practice! It violates human rights and the consequences of the practice are far-reaching. Nigeria's authorities, including the new President - Goodluck Jonathan, should ensure that the investigation does not "die a quiet death" before justice is served. 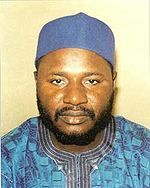 Photo of Ahmed Sani Yerima from Wikipedia. Outrageous! My bet is, it will 'die a quiet death', UNLESS the Nigerian government has 'improved' into one of few African governments that actually govern by law and hold folks accountable. Great article!